The Tomahawk 1-4x24 LVPO provides impressive clarity, durability and accuracy. It has a monster eye relief of 6" at 1X and a 5.25" at 4x, with a very comfortable eye box. Sporting a Second Focal Plane (SFP) glass etched illuminated reticle designed for dynamic shooting, and an included throw lever for rapid magnification adjustment, this highly versatile scope is ideal for 2 & 3-gun competitions. 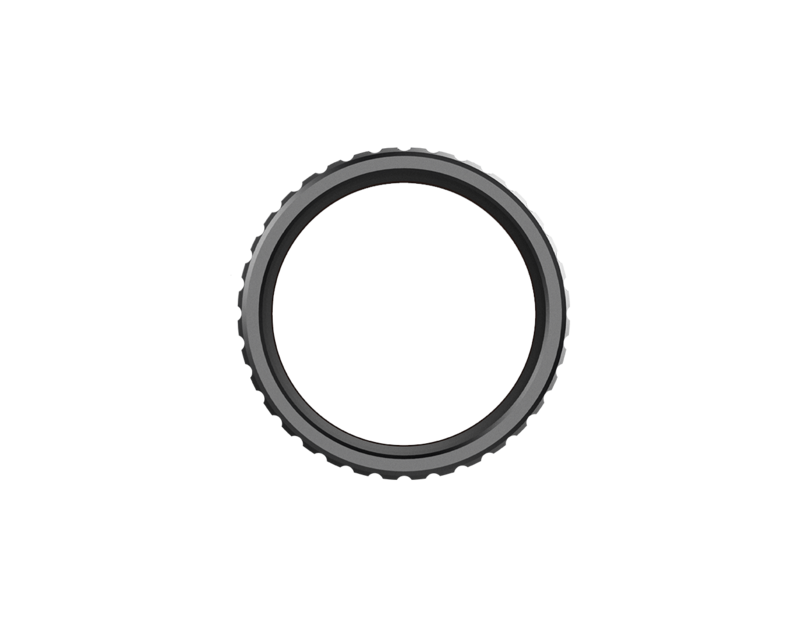 Choose between the two different reticle options, the Guerrilla Dot BDC™ and Guerrilla Cross MOA™. for is here. Meet the Tomahawk. Both the BDC and MOA illuminated etched reticles are designed to instantly acquire your target at short and medium range from a preset 50/200 yard battle sight zero. With true 1x optical performance, this rifle scope and its reticles are designed to act like a red dot sight at short range. Keep both eyes wide open and maintain your focus on the target. Crank up the magnification and have confidence in those long range shots with ultra bright sight picture. Both illuminated, glass etched reticles incorporate ranging and long range holdover aiming cues. The larger reticle vs. the target size at lower magnifications afforded by the SFP is Ideal for 3-Gun competition or tactical shooting, allowing you to find and hit those short range targets faster. Because your holdovers are only accurate at the highest magnification, the included throw lever allows you to crank up or slam down the magnification in a split second. The Tomahawk boasts edge to edge optical clarity throughout the entire magnification range. Impressive true 1x magnification. An instant 1x sight picture gets you on target faster, without having to adjust your eyes' focus. Containing rare earth metals, the glass is optimized for maximum resolution and brightness. The lenses are fully multi-coated for maximum light absorption and anti-reflection, and sports extra specialty coatings for anti-fog, anti-scratch, and hydrophobic performance. Rifle scopes at this price range often have a limited margin of error for eye placement, creating ellipses and blocking the full sight picture unless your eye is positioned perfectly. The Tomahawk widens this margin of error, providing more speed and flexibility in acquiring your sight picture at full magnification. Everybody’s eyes are different. The fast focus adjustable ocular allows for micro adjustments to keep the reticle sharp at all times, whether illumination is on or off. The optic system is a finely tuned machine, allowing for generous eye relief while maximizing field of view. You won’t get fatigued looking through this scope. Zero reset turrets provide more flexibility and just work better than most zero-lock turret systems. Zero the scope to your preferences and adjust your dial markings to mark your ‘zero’. Always know where your zero is without counting clicks. This system works great for shooters who prefer to dial for windage and elevation. For shooters using the reticle holdovers, set your zero and leave the turrets alone- and if the turret somehow gets bumped, simply dial it back to zero with a quick twist. Calibrated for the AR platform with a 16” barrel and using 5.56 NATO 55gr FMJ, this reticle does it all. It has a 2 MOA quick strike red dot, an 18” outer circle for quicker strikes at short range, holdovers out to 600 yards, and ranging capabilities for plinker plates and humanoid target shoulders out to 500 yards. 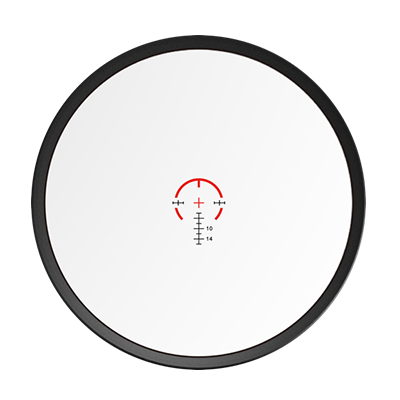 This reticle combines quick strike capabilities as well as standard MOA hash marks for windage and elevation adjustments. 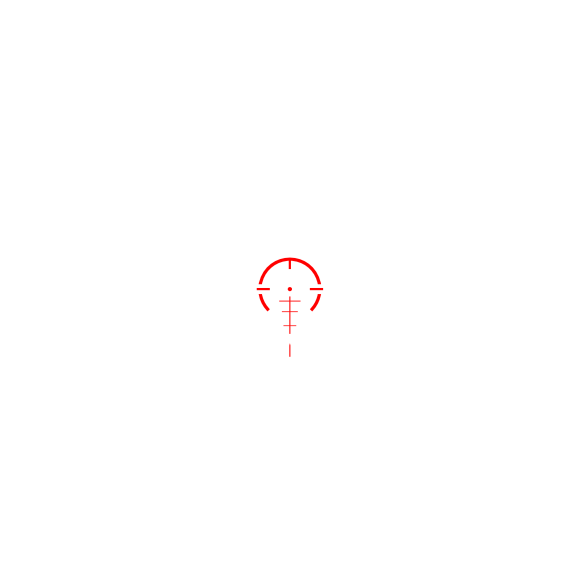 It features a center cross with a 0.5MOA center aiming point at the cross intersection, and an 18” outer illuminated circle. Use the red illumination markings for quick strike capabilities, and the black markings for standard MOA ranging and holdover calculations. Ever have that feeling that you need to treat your gun with kid’s gloves because you are worried about damaging the glass? Well, you can shed that mindset with Swampfox. The Tomahawk is shock resistant to 1,100 Gs of shock, waterproof, sand proof, and pretty much gorilla proof. The Guerilla Dot BDC is highly versatile, capable of delivering rapid target acquisition at true 1x power, while also delivering various holdovers for mid to long range shots. as well as precision shooting for longer shots. Need for Speed is the name of the game in Close Quaarter Battle. 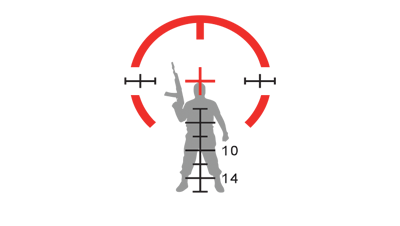 Focus on the illuminated portions of the Guerrilla Cross reticle when you need to strike fast. 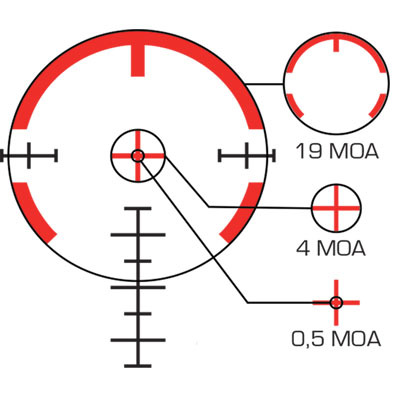 The red illuminated circle has an outer diameter of 19 MOA, and an inner diameter of 16 MOA. For targets up to 200 yards, when speed is critical and you just need a hit rather than precise placement, aim big and frame your target in the horseshoe and fire. The center illuminated cross has a total diameter of 4 MOA, cut in 2 MOA increments east to west, and from north to south. If speed is the still the name of the game but a bit more accuracy is required, focus on placing the entire cross on your target as you squeeze off your kill shot. The center illuminated cross is comprised of 0,5 MOA thick lines, providing a precise crosshair that won't block your view on small targets. The center crosshair allows you to achieve tight groupings from 50-200 yards. Target Size (inches) x 95.5"
In order to obtain accurate range, you need to know the size of the target. Using either the vertical or horizontal hash marks, measure the MOA of the object that has a known size. The reticle has various points of reference to measure MOA, including the black hash marks which are all indicated in increments of 2 MOA. Example #1: Assuming this combatant is 6 feet [72 inches) tall, and his body length comprises 15 MOA in your reticle, how far away is he? Crisp glass, great reticle, awesome features and accessories. Can't recommend this highly enough.